INTRODUCTION: Vessel sealing devices of 5 mm in diameter for laparoscopic surgery provide only a small breadth of sealing area. Therefore, various double sealing techniques have been tried to enhance bursting pressure of the sealed vessels by surgeons. 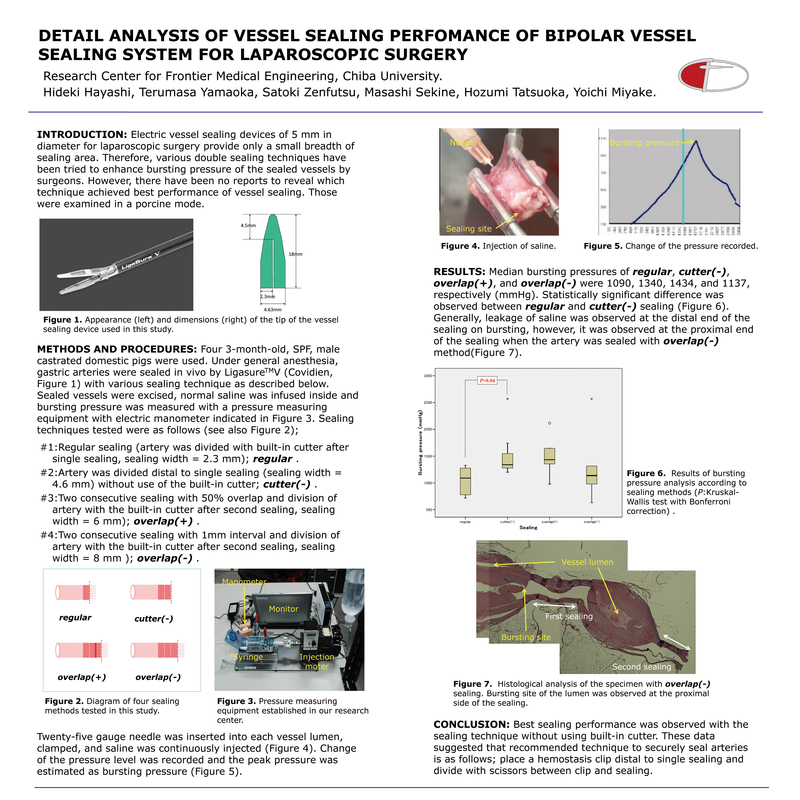 However, there have been no reports to reveal which technique achieved best performance of vessel sealing. Those were examined in a porcine mode. METHODS AND PROCEDURES: Three 3-month-old domestic pigs were used. Under general anesthesia, gastric arteries were sealed in vivo by Ligasure V with single or double sealing technique. Sealed vessels were excised, normal saline was infused inside and bursting pressure was measured with electric manometer. Sealing techniques tested were as follows; #1:Regular usage (artery was divided with built-in cutter after single sealing, sealing width = 2mm), #2:Artery was divided distal to single sealing (sealing width = 5mm), #3:Two consecutive sealing with 50% overlap and division of artery with built-in cutter after second sealing, sealing width = 5mm), #4:Two consecutive sealing with 1mm interval and division of artery with built-in cutter after second sealing, sealing width = 8mm). RESULTS: Mean bursting pressures of the tested #1-#4 were 1064, 1732, 1361, 1053, respectively (mmHg). Generally, leakage of saline was observed at the distal end of the sealing on bursting, however, it was observed at the proximal end of the sealing when the artery was sealed with double sealing technique #4. CONCLUSION: Best sealing performance was observed with the sealing technique without using built-in cutter. These data suggested that recommended technique to securely seal arteries is as follows; place a hemostasis clip distal to single sealing and divide with scissors between clip and sealing.